Myanmar is big country rich in culture and it’s worth spending as much time here as you can, but if you only have a week to spare, I’ve put together a suggested itinerary for one week in Myanmar. This is just a guideline- ever traveller is different- but this is how I spent my 7 days in Myanmar. Back in December 2012, my friend and I decided to end our trip through Southeast Asia with a visit to Myanmar. We booked tickets on Air Asia, flying from Bangkok to Mandalay, and then from Yangon back to Bangkok. We got rally good fares because we booked in advance, and it only cost us about $50 USD each way. At this time Air Asia had only just started flying to Mandalay and previously travellers had to begin and end their trip in Yangon. This meant that it was a bit more difficult to see Myanmar in a week because you had to do one big loop, travelling up the country and then all the way back down again. By flying into Mandalay and out of Yangon, or vice versa, you only have to travel in one direction. Up until more recently, Myanmar has been a country shrouded in mystery. Gradually more and more information has been appearing online, but when I was researching the trip in 2012, there were only a handful of blogs and websites providing practical details on how to travel Myanmar independently. Most websites I found on Google advertised expensive group tours and I wondered just how possible it was to see the country on a budget. I’m pleased to say Myanmar was a pleasure to travel around and I found it wasn’t so difficult after all. 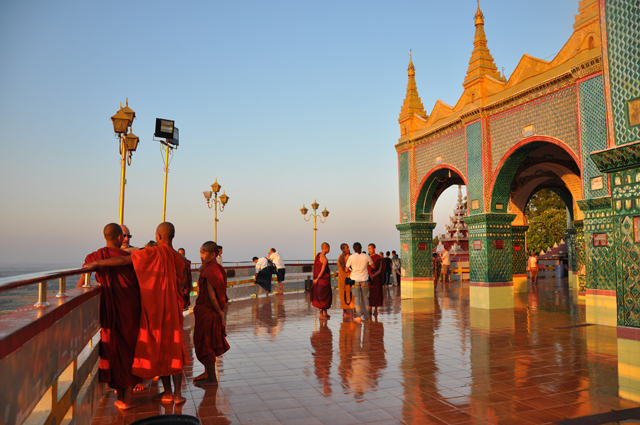 Myanmar is a huge country and if you have more time, there’s so much to explore. 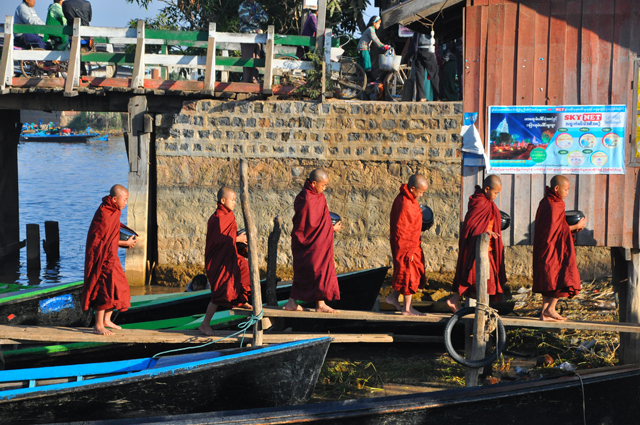 But if you only have a week like I did, the main highlights for any tourist are Mandalay, Bagan, Inle Lake and Yangon. 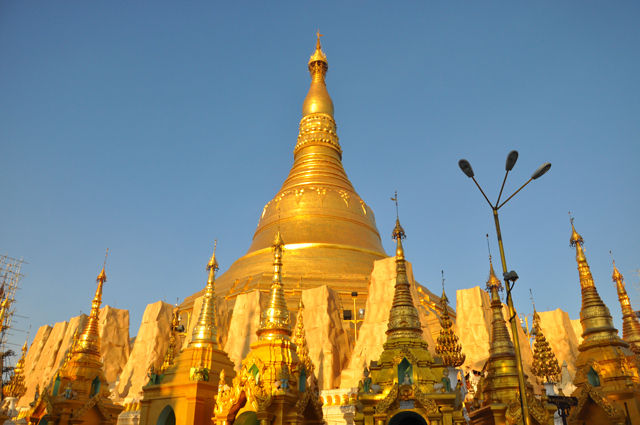 My suggested 7 day itinerary for Myanmar covers all these destinations. I absolutely loved this country, not only did I manage to capture some beautiful photos, I also thought the people were some of the friendliest I had ever met. Taking a trip to Burma/Myanmar is like taking a trip back in time and the scenery is absolutely stunning. Don’t feel like you need to book some expensive tour package to see Myanmar; it’s totally possible to see Myanmar independently on a budget. However, please note that with the increase in tourism prices are skyrocketing, so any prices listed here may be higher than I paid in 2012. Fly into Mandalay (With Air Asia we arrived around 10:35am). There are money changers at the airport, so change some of those US dollars you’ve brought into local currency- the Kyat. You can haggle on a taxi price to Mandalay- it should be roughly $12-$15USD. Head to your accommodation to drop off your bags; we stayed at the Nylon Hotel. If you want to book a room you can find details on their Facebook page and on the Lonely Planet website. You’re then free to explore the city. Since Mandalay was hot and dusty, and we had no idea where we were going, we negotiated a fare for a driver to drive us around for the day. Admittedly we hadn’t done much research on the main attractions in Mandalay, but he knew exactly where to go and devised a little itinerary for us. 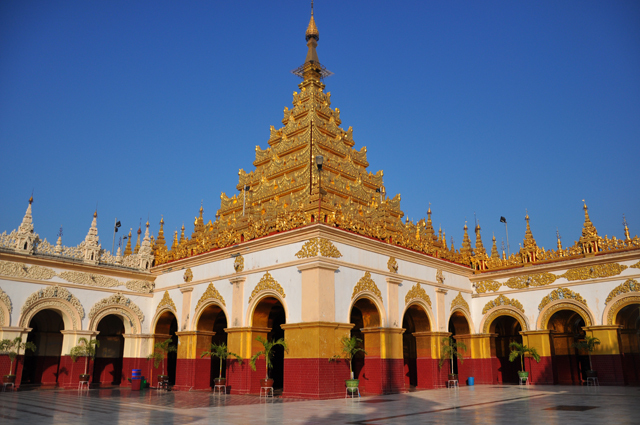 Our first stop was the ornate Mahamuni Buddha Temple, then we visited the Kuthodaw Pagoda– a Buddhist Stupa that contains the world’s largest book. Finally we ventured up to the top of Mandalay Hill for a view of the sunset. For an inexpensive dinner, make sure you pay a visit to the Chapati Stand in Mandalay at 27th and 82nd- this place is in the Lonely Planet Guidebook. 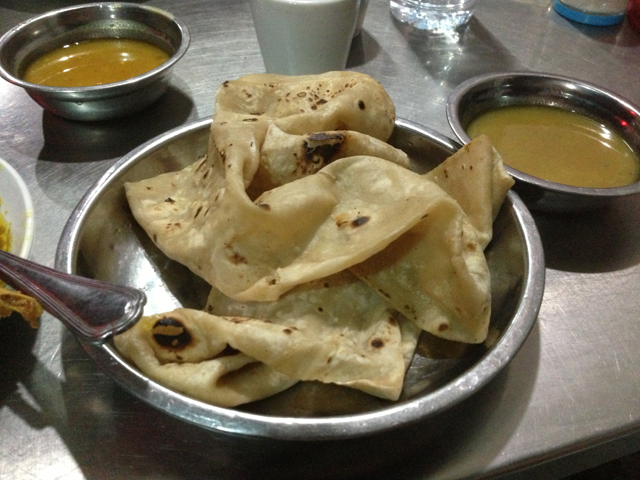 This streetside restaurant is great if you’re on a budget and serves the most amazing chapatis with curry. It’s full of locals which is always a good sign, and you dine outside on the street. The food was so delicious I’m drooling just thinking about it. 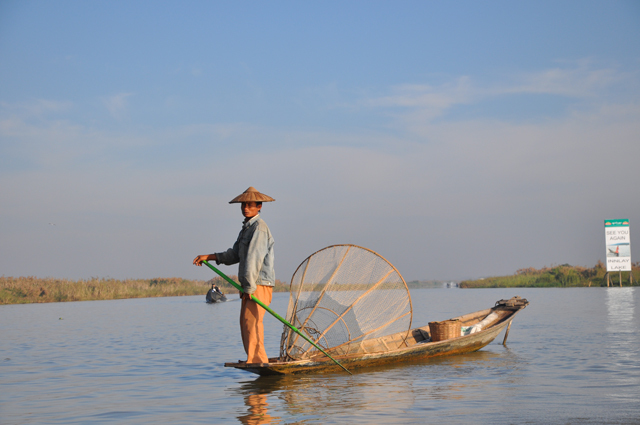 There are a number of ways you can get to Bagan from Mandalay- by train, bus or boat. The boat was more expensive but also the most scenic and relaxing option. 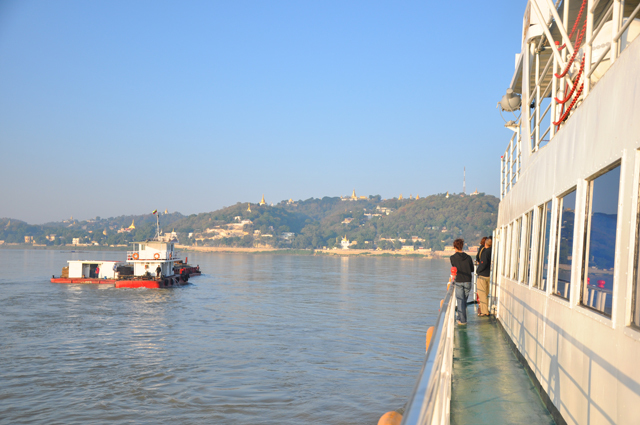 This 9-hour express ferry travels down the Ayeyarwady and costs around $43 USD. We booked it through the Nylon Hotel in Mandalay and paid in USD. 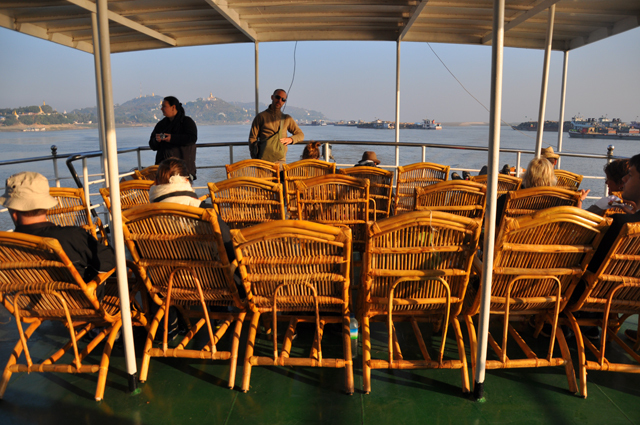 The boat has a restaurant on-board serving hot meals and drinks, as well as an outside deck with chairs so you can sit and admire the views from the Ayeyarwady. I spent most of the time taking photos, chatting to other tourists, reading a book and sitting out in the sun. It was a really relaxing experience and the friendly locals wave at you from the banks of the river as the boat passes by. 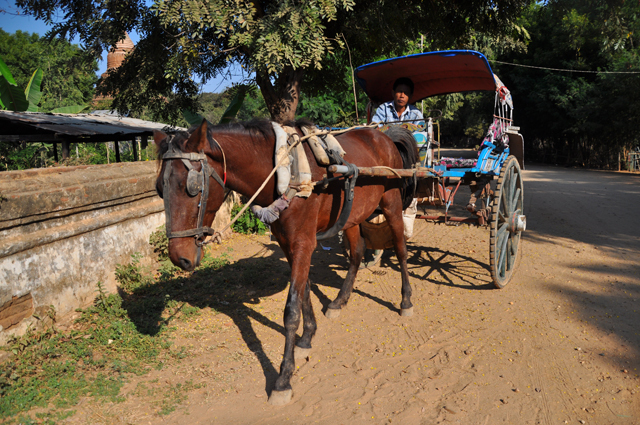 Upon arrival in Bagan there will be lots of locals waiting for you with their taxis or horse and carts to take you into town. 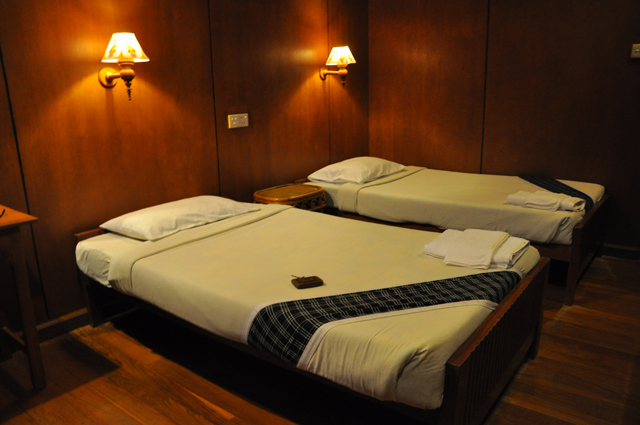 We booked the Aung Mingalar Hotel Nyang U- the Superior Double or Single is the cheapest available costing $50 USD per night for 2 people. This was the nicest of all our hotels in Myanmar and the WiFi was pretty decent, although I could only get it in reception. Contact details are available on their Facebook page and you can also book via Agoda. 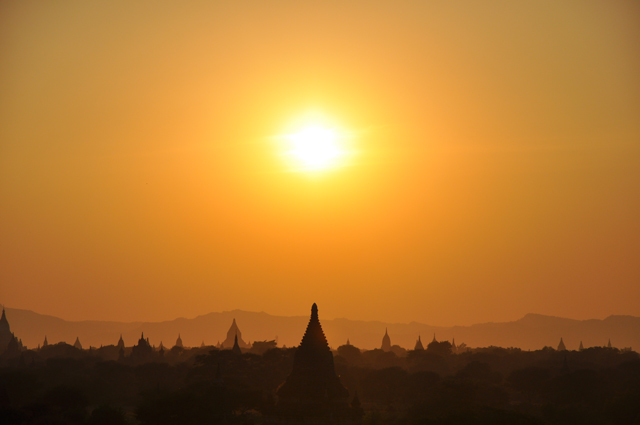 The temples of Bagan are out of this world and the highlight is watching sunset over this incredible landscape. There are basically three ways you can see Bagan- by horse and cart, air conditioned taxi, or by renting bicycles and exploring the area yourself with a map. Which mode of transport you choose is really up to you and what you prefer, but the horse and cart is the most novel. We organised a horse and cart through our guesthouse for $16 USD, which included a full day of sightseeing from just after sunrise, right the way through the day to sunset. We visited SO many temples that I was a bit mind-boggled, so if I were to do it again I would just do a half day and then see sunset. But it really depends how much you enjoy visiting temples. The day ends with a cracking view of the sunset from one of the climbable temples. 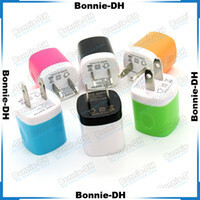 In the evening I recommend visiting the main restaurant/nightlife street and visiting a restaurant called Black Bamboo. It had a lovely outdoor garden area with wicker chairs and fairy lights, so I loved the ambience of the place. 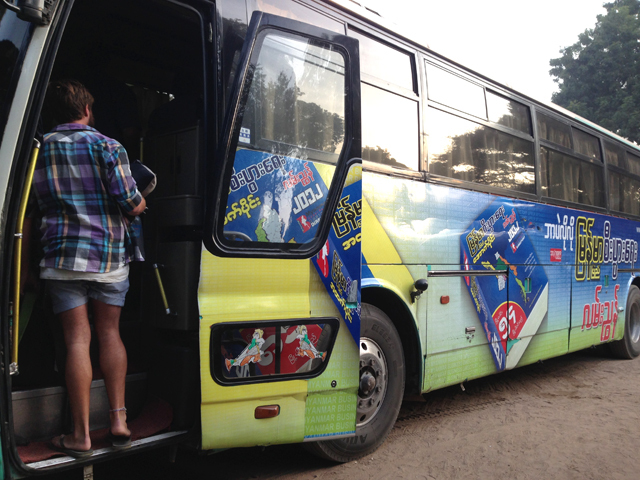 The bus to Inle Lake is a day journey, so we spent most of the day on the bus. Despite what I read about these awful bus journeys in Myanmar, the bus was really comfortable, so I was pleasantly surprised. I have a feeling they have been upgrading the buses due to the influx of tourism. It’s a lovely guesthouse with WiFi and a free breakfast in the morning- not much more I could ask for. Since we arrived in the evening we organised our boat trip for the next day and walked into town to find something to eat. We had some traditional Burmese food at Lin Htett, which is a popular local restaurant serving curries and salads. 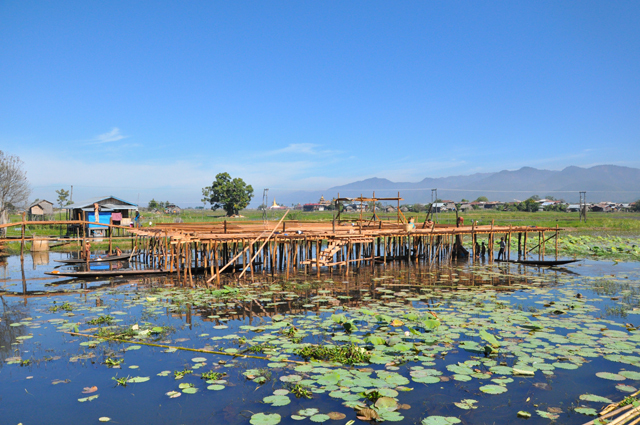 Our boat trip on Inle Lake was definitely the highlight of my trip. It cost around $20 USD and we started in the early morning. The boat driver will take you to a standard set of sights, and you’ll visit cigar makers, weavers, jewellery makes, blacksmiths, boat builders, Karen people etc. They will try to encourage you to buy things from their shops and the boat drivers get commissions, but I never felt too pressured into buying anything. I didn’t see many other tourists at the time, but things may have changed since then. 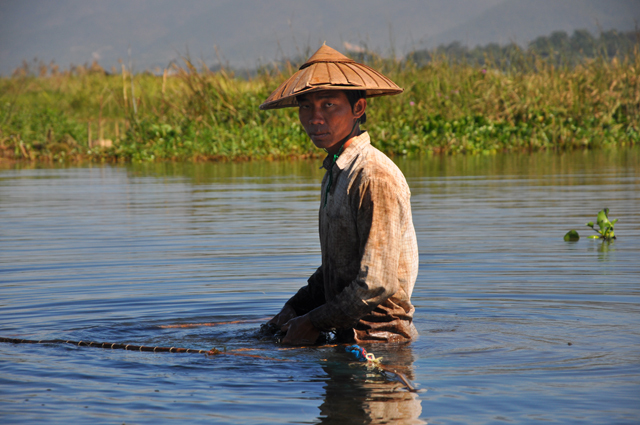 Inle Lake is incredibly beautiful and the fishermen are very photogenic, so bring your DSLR camera. 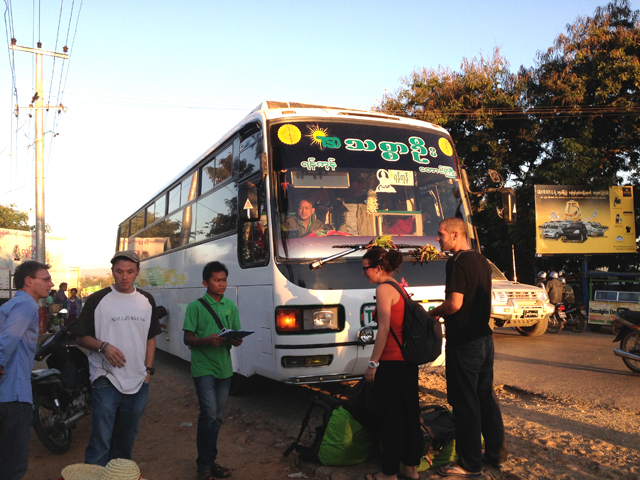 The bus from Inle Lake to Yangon was an overnight bus, which departed before sunset and arrived in the morning. 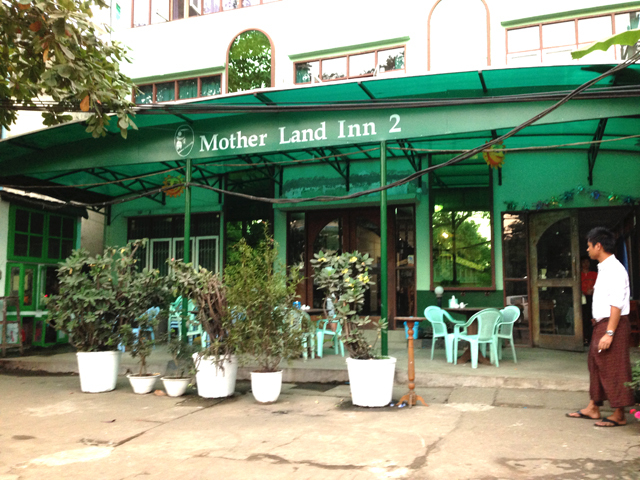 In Yangon we stayed at the Motherland Inn 2, which also happens to offer a free breakfast and a complimentary shuttle service to the airport. 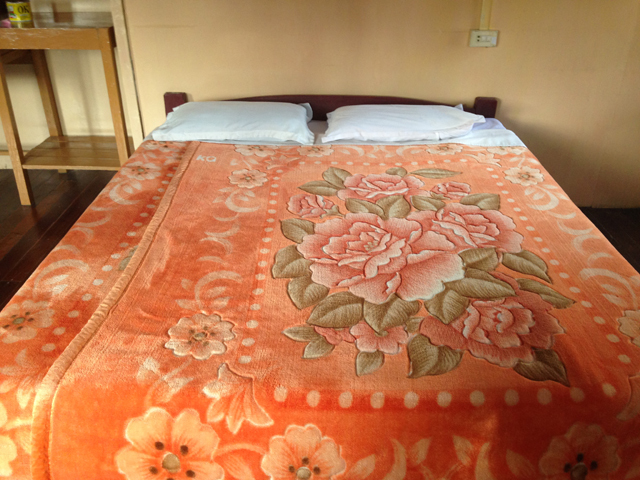 A double room with fan and shared showers cost $25 USD for two people per night. Email and telephone contact details are available on their website for reservations. Since we arrived on the bus in the morning at 7am, that meant we had a full day to explore Yangon. We were feeling a bit tired and exhausted by the end of our trip, so we visited the Bogyoke Aung San market for a haircut and then relaxed on the grass next to Kandawgyi Lake, before visiting Yangon’s most iconic structure- the Shwedagon Pagoda. We ate dinner at the restaurant in our guesthouse. Our guesthouse provided a complimentary ride to the airport to catch our morning flight with Air Asia from Yangon to Bangkok. Got any questions? Leave your comments below! Your pics are so beautiful thank you! Also, with things the way they are in Thailand right now – http://www.bbc.com/news/world-asia-27585297 – maybe more people will head to Burma / Myanmar. There is a gem of an article with more on the rich culture and heritage for fellow travellers – http://www.travelindochina.co.uk/blog-articles/welcome-to-burma – may be of interest. This looks a great week. My wife and I did cambodia last year and now fancy Myanmar tying it in with a lazy beach week after somewhere. Can’t decide firmly though whether this wld be better than a fortnight in the phillipines. Thanks for the article it looks amazing and we may just follow your trip exactly! Any issues with food poisoning while you were there? did you find any of the buses were actually the VIP ones with only 3 abreast rather than 4? | am curios to as they actually exist?